I'd never heard of quinoa until I was vegan and quite frankly, I still pronounce it incorrectly half of the time. I've read enough veg magazines and cookbooks to know quinoa is good for me and I've done a pretty good job at incorporating it into my regular diet. I was recently introduced to amaranth, which is a close relative to quinoa, only smaller. 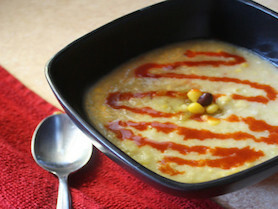 An ultra-healthy creamy corn soup with a little spice and a lot of nutrients. Cook the quinoa or amaranth in 3/4 cup water for 10-15 minutes (until completely cooked and water has evaporated). Transfer to your blender and add 1 1/2 cups corn, chilis and non-dairy milk and blend until smooth. Transfer to a medium saucepan, stir in remaining corn and black beans and heat thoroughly. Add white pepper and maple to taste. Serve and garnish with hot sauce.